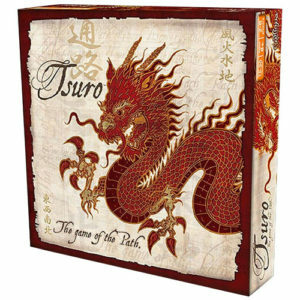 Concepts: Should you read the details on the box for Tsuro, you will find that it offers you a game that is rather unusual. In Tsuro, you and a group of players take it in turns to place tiles upon the table. Each tile contains four lines (two on each corner of the tiles), which weave and circle around one another to create different pathways. On your turn, you will place a tile and move your marker token along the newly formed pathway, occasionally taking unexpected turns if you do not try to plan your route carefully. Tsuro frames this as an allegory for the paths through life itself, moving along the ebb and flow of time – sometimes able to plan ahead, and sometimes at the whims of destiny. That’s all well and good, but it doesn’t promise an enjoyable gaming experience. Thankfully Tsuro is a highly enjoyable game as well. With a new set due soon at the time of writing, now is a good time for me to cover the game’s original version. Writing: There are almost no written details for the game. You have no cards, only tiles and tokens. The rules, though, are extremely clear – this helps because gameplay is very intuitive. As a result, people with reading difficulties will have no issue in understanding this game, and it is suitable for players of almost any age. Mechanics: Tsuro contains almost no mechanics, in terms of dice-rolling or card drafting. Play progresses around the board, from one player to the next. At the start of play, each player draw three tiles from the stack, and places their token on one side of the board (the board of which is sized for 6×6 tiles). At the start of the active player’s turn, that player places a tile from their hand onto the board, so that it connects to their token. The players then all move their respective token along the newly-formed path if they are affected by the placement of that tile, and then the active player draws a new tile from the stack to their hand. Play continues until two player’s tokens collide, in which case both players are out of the game, or until a player’s token leaves play by means of following a path off the edge of the board. The last remaining player is the winner. 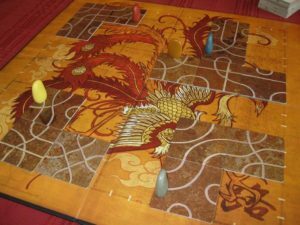 Design: Tsuro maintains an aesthetic which strives to be reminiscent of Chinese mythology, right down to the artistic choice of a phoenix and dragon in the game’s material to reference Suzaku and Seiryu respectively. The material continues this design philosophy by creating the rules booklet in a similar style. In terms of the gameplay itself, the minimalist design works well. Playability: Tsuro is, as I’m sure that you can imagine, a rather challenging game with the right group of players. It requires the same type of mindset that you would need to excel in a game of chess, demanding you to think several moves ahead of your rivals. However where it truly shines is in a large scale game. With more players, the pathways form quicker and everybody is forced to struggle not only for space on the board but to plan just how far they will be able to travel safely. It becomes a challenge to navigate yourself into a position whereby other players will be unable to lay paths that would knock you out of the game before it ticks around to your next turn. This creates a lot of fun, but it is also very easy when beginning to play the game (or even if you are simply careless at any point) to accidentally place a tile that leads you down a very bad path, sending you into a corner you may not be able to navigate out of or even spiralling off the board entirely. Very careful planning is required, and even with that, a lot of your chance of victory or failure quickly comes down to what moves the other players might take. Conclusion: Tsurois a strong game to start off an evening with. It feels light due to its minimalist aesthetic, but can quickly get the mind in gear and ready for some excellent planning – for that reason we like to open our gaming nights with a round of this. Don’t come to it expecting the intricate complexity of Scythe – instead, this is a strong gateway game that will last about half an hour or so and keep everybody entertained. 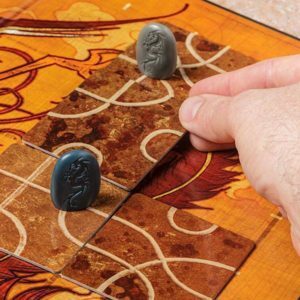 FINAL THOUGHTS: Tsuro is a charming game that gets the mind going, encouraging you to plan your route carefully – a solid and enjoyable game.